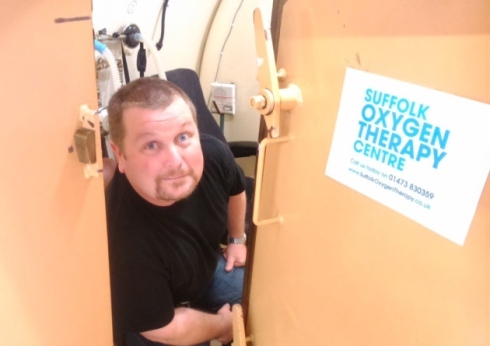 One of the team at the Suffolk Oxygen Therapy Centre is to spend 24 hours in a hyperbaric chamber to raise funds – and awareness – of this local charity. Fortunately, Sean Chrysanthou, who has been administrator of the local charity since last year, isn’t claustrophobic . . . but even he admits it’s going to be a long time staring at the chamber’s curved walls. Sean, 41, will enter the chamber for his sponsored ‘lock-in’ immediately after the charity’s annual open morning, which is taking place between 10am and 1pm on Saturday. He said: “We’re keen for as many people as possible to come along on the day and discover what oxygen treatment could do for them. “We are a charity established to help people with Multiple Sclerosis, but oxygen treatment can help with a whole host of other problems, and we’re here to help as many people as we can. The open morning is an opportunity for the public to see what the charity does and for people to meet the team. The open morning will take place at the centre itself on Claydon Business Park, Great Blakenham – just off the A14. There will be plenty of free parking, and the centre has disabled access. The Suffolk Oxygen Therapy Centre is a self-funded local charity that has been helping people with Multiple Sclerosis, and other conditions, for more than 30 years. therapy.co.uk or call 01473 830359.